economics, trade and investment, Vietnamese Ambassador to the Czech Republic Ho Minh Tuan has said. 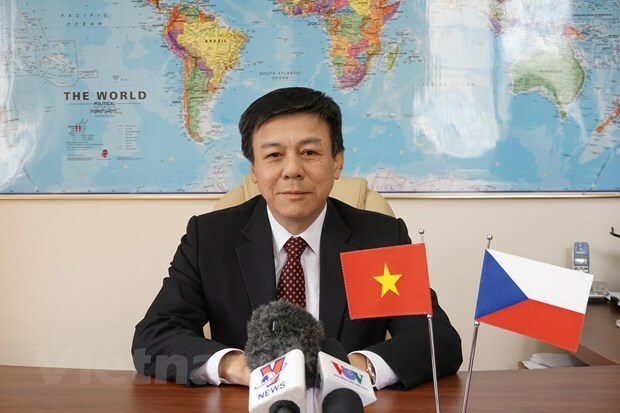 In a recent interview granted to the Vietnam News Agency’s correspondents in the Czech Republic, Ambassador Tuan highlighted the significance of the visit, saying it aims to affirm that the two sides will continue maintaining the exchange of delegations, thus fostering their friendship and traditional relations. During the visit, the two sides are scheduled to discuss and approve specific agreements to create favourable conditions for ministries, sectors and localities, as well as businesses to seek partners and collaborate with one another. The visit is also a good chance for the Czech side to seek opportunities for its enterprises to access a dynamic and potential market like Vietnam. Regarding the purpose and cooperation prospects between Vietnam and the Czech Republic in the coming year, the diplomat said although positive growth is recorded in trade, it is still not commensurate with the cooperation potential between the two countries. The two sides should further strive to create special breakthroughs in their economic ties, he stressed. Two-way trade between Vietnam and the Czech Republic in the last five years has more than doubled, hitting 1.2 billion USD in 2018 from 547 million USD in 2013. The number of Czech enterprises investing into Vietnam in recent years remains limited, mainly small projects signed on the occasion of the visit to Vietnam by Czech President Milos Zeman in 2017. The two countries have discussed how to bolster their investment cooperation at workshops and conferences of the Vietnam – Czech Republic Intergovernmental Committee, he said, adding that labour and tourism links between the two sides still see certain obstacles. With the PM’s visit, Vietnam hopes to have a new development milestone of the bilateral relations in the future, especially in economics and trade, Ambassador Tuan said. In the framework of his visit, PM Phuc will hold talks with his Czech counterpart Andrej Babis on comprehensive cooperation across the fields of politics, economics, defence, and culture-education, he added. PM Phuc will attend the Vietnam-Czech Business Forum, which will serve as a venue for the two sides’ enterprises to meet and set up partnership. He will also receive representatives from a number of Czech firms which are interested in the Vietnamese market, especially in automobile manufacturing, power generation, consumer industry, beer production, and entertainment services. Bamboo Airway of Vietnam is seeking to set up a direct air route between the two nations, Tuan revealed. PM Phuc will witness the signing of a number of cooperation agreements between ministries, sectors, localities and enterprises of the two sides.